This is easily our favourite video from last night! 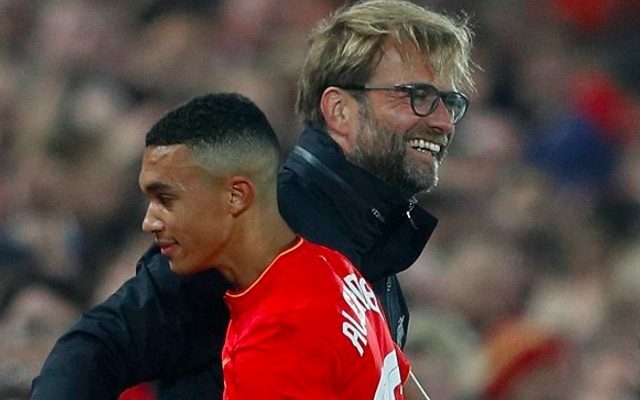 When Trent Alexander-Arnold was substituted late on, Jurgen Klopp went to give him a professional handshake – but the 18-year-old was having none of it! Instead, the fullback went for the full embrace – clearly grateful at his boss for giving him the chance to make his first-team bow after 12 years at the club as a junior. We’re massively excited by T-Double A and think he’s already good enough to be considered Nathaniel Clyne’s primary backup option.